If you don’t know about Glyndebourne, it’s an opera festival that takes place every summer at the big Sussex country house of the same name. It’s been going since the 1930s (apart from during the war) and my grandparents used to have a season ticket. I never got to go, although I was always fascinated to hear the stories and the drop-dead glamorous outfits that used to be on show. I always imagined the ladies in gowns, dripping with diamonds and furs, the gents in black tie! This year, Ariadne and also the production of Verdi’s Falstaff which is running at the same time, have both been set in the 40s and Glyndebourne attendees are being encouraged to get into the spirit themselves. I will be taking my camera along and capturing my day and all the best outfits around me. But I was having a nosy at the images from the production and because some of the costumes are so cute, I thought I’d also use the opportunity to do a little V.I. Buys post! How fun is this costume? A bustier and striped shorts with a skirt to put over the top and a pair of awesomely stripy wedges. Tara Starlet have some striped shorts in their new Mix and Match range that look very similar! Paired with a Halterneck Top from Vivien of Holloway with the strap tucked in (or removed) it would be a dead ringer! And I’ve been looking for an excuse to post about these amazing carved Miss L Fire sandals from their latest collection. She also has a skirt cover-up on in other shots. If you wanted something like this, you could get the lovely Time Machine Vintage on Etsy to make you something custom. 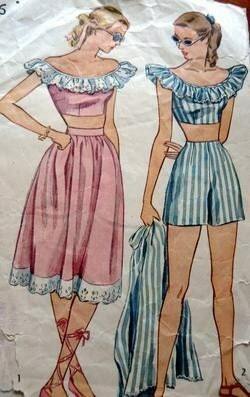 I have always coveted this little set! While browsing on Etsy I also found this custom made dres/playsuit and this amazing pattern! Argh! 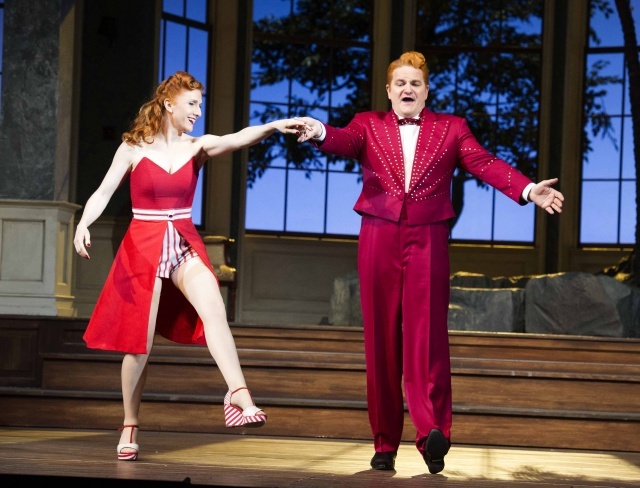 In other production shots, a different beautiful redhead is wearing a snazzy polka dot dressing gown. Now, I can’t reveal too much, but you may be able to get something sightly similar from the sumptuous Betty Blue’s Loungerie next season. Have a read of Betty’s blog to get the full scoop but here’s a sneak peek of me from the photoshoot! Hint: I know this is peach but there’s also going to be a spotty one! The last outfit I was coveting is this glorious ensemble of gown with turban and leopard swing jacket. Turbans aren’t so hard to come by (albeit you need to search for 1970s ones as 40s ones are much more rare) and H&M currently has some sunglasses that are a dead ringer for these 1930s/40s ones. I have these myself, of course! But the only way to find such a leopard-print treasure of a coat is to search diligently on eBay. 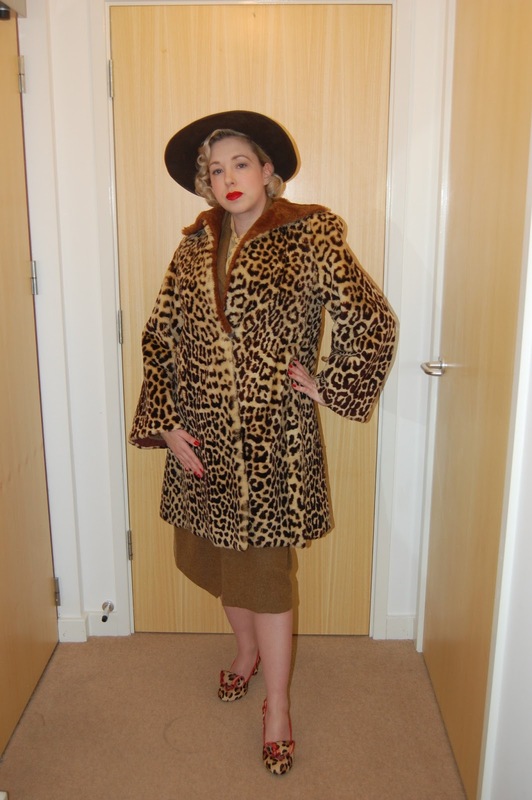 My beautiful friend Lisa (whose blog is idle) has one – a vintage 1940s CC41 sheepskin jacket painted to look like leopard. Isn’t she a doll? Anyway, back to Glyndebourne – I can’t wait for Friday, it is going to be magic. I have no idea what I shall wear myself yet, but you can bet your bottom it’ll be a long gown. Please keep everything crossed for fine weather and check back to see my photos of the afternoon and evening! Have you been to the opera lately? Did you use it as an excuse to dress up to the nines? Awesome! I didn't fancy Falstaff and this is my birthday Friday so wins all round! Hope yours is good. The wedges used in the show are from clarks! Yes, they're much more interesting! I really enjoy your VI posts – more please! Eeep! The costumes! I totally die! Ooohh, one of things I miss most about living in a big city is having an opera house or company (don't get me wrong, I love where we live, but it could do with more cultural arts for sure!). I had the great pleasure of attending two operas and a stage performance of The Sound of Music when we were living in Toronto, and dressed up to the nines for all three. Oooh you lucky, lucky thing, you! Have fun. I miss the theatre sooo much, nothing even close to me, well, there is one about 80 odd miles away but what they have is a joke. The place is a cultural desert as far as this sort of thing is concerned. i wish you a nice event and the the best wether! can´t wait to see the pictures…………. Oh, you are SO lucky. 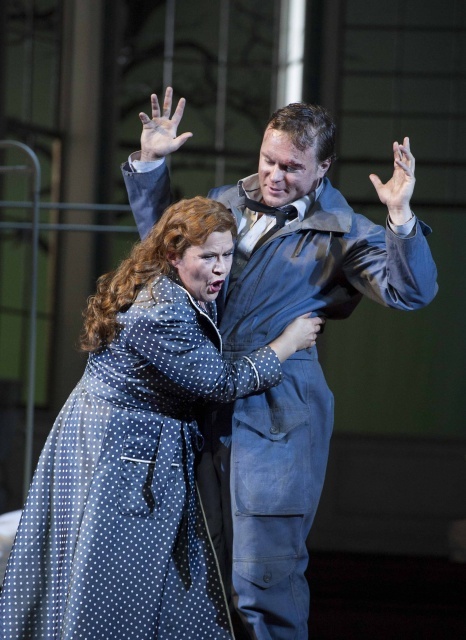 I hope you have a blast, Ariadne auf Naxos is quite the silly opera. (I do love Falstaff, too) I look forward to seeing your pictures… I always love to dress up for the opera, at least, that is, if I'm not IN the opera! That sounds like such a great show! Have an awesome time! Sounds fun! Have a fabulous time. Oh wow the opera sounds amazing! I have just been invited to a garden opera later on in the summer and need to find the perfect outfit, so will obviously be scouting through London's vintage shops and dress agencies this summer. The peach look is divine by the way – looking forward to a review of the opera and photos of the outfit! Wow that sunglasses are really nice. Now that's vintage.